I can hardly believe the big day is almost here! In today’s project I created faux ribbon on a masculine birthday card. I masked (yes, I know I use this technique way too often, but it is so versatile! )off a stripe on the cover of a kraft card with typing paper. I sponged in between the masks with white craft ink. I removed the masks and that left me with my "naked ribbon". I added stripes using not quite navy dye ink and the "stem" stamp from the set. (A little hint when creating these stripes. The stamp is not long enough to stretch across the entire width of the card, so I stamp once from each side, allowing the center to overlap. Then when I add my sentiment accent, it covers the "overlap".) I than added a few additional stripes with a white gel pen. You could use the same technique with a variety of colors and patterns. It is a great "bare bones" project that would be a perfect fit with just about any sentiment. WOW Very nice. I bet it looks better in person…..Love it. That is really beautiful! Perfect for a man! I’m glad I stopped by again today. This is a great idea for a guy in your life. So simple yet beautiful. One more day! I can’t wait to see the unveiling. This is so striking and just beautiful. Wow! That’s very cool. I thought it was ribbon until I read the blog! I am so excited to see your stamp set! Cool technique! Once again, you rock! Simple card with simple lines. I love it. I think we tend to try and do complicated techniques when many times a card that is designed well with the right colors and elements is all that is needed. You are such a talented artist, please continue to share your amazing talents with us. I love how you did the stripes on this card! So cute! love the stripes on the kraft – so versatile, could be used for just about anything! Perfect card for a guy and I like the simplicity of it. Very nice. Great man card! One can never have too many man ideas! Thanks for sharing! That faux ribbon technique is great!!! TFS!!! I also love the font on the message…. What a delightful, clean design!!! Love it!!! What a cool idea! I love this card. Thanks for sharing how you did it. Two more sleeps! Love this card! Love the faux ribbon, very cool! So simple and yet detailed and beautiful. So aweseome to see great masculine cards that I can actually reproduce!!! Very clean & simple! Love it! Great men’s card! I always find men’s cards the hardest to do. This is really inspiring, thank you! Faux ribbon – once again you think of the most interesting ways to incorporate simple and clean designs. Love the faux ribbon technique!! Thanks for sharing! Too much masking?! Is there such a thing?! 🙂 Wonderful card. I think it is such a strong use of kraft – all too often it becomes too shabby chic too quickly. This is anything but! What a great technique – Thanks for sharing! Wow! I just found this today and can’t wait to see the sets released later in the week. I love this card. It is such a simple design but classy. I thought what a great card for the men in our lives. Somtimes it is hard to make a card that is masculine! Love the simplicity – this is an awesome ‘guy card!’ Can’t wait to see the set! I just love this card! I always have such a hard time making masculine cards and when I add ribbon it usually ends up looking feminine not matter how hard I try. But this totally works! I’m going to try this myself! Can’t wait to see the other sets this week! Good luck! What a great card. So simple, yet so eye-catching! This is a beautiful card. Classic, clean, elegant, stunning. TFS. Wow, I never thought about faux ribbon! Looks great! Very cool how you did the faux ribbon! WOW!!! I had to look twice for the faux-ness! What a clean, crisp look this card has. Looking forward to seeing the stamps!!! Wonderful card! Love the simplicity of it. I actually love to do masking myself! Thanks for another great idea. You know, we’re getting spoiled with these new cards every day and we could get used to you posting daily. We ,might not let you stop! Love the masking & that it’s masculine! It’s hard for me to get masculine ideas!! Love it! What great ‘ribbon’! This is such a striking and grapically clean design. Love the hardware, too! I’m really excited for your grand opening! such a beautiful, yet classy design. well done! I love the simplicity of this card. I can’t wait to try it. I am going to check your blog dailey. I really like all I’ve seen. Love the faux ribbon…can’t wait to see what else you have in store! How clever! I love almost anything on kraft paper. Simply amazing! thanks again for sharing your talent! I love this. It is so clean and crisp. Wow – Nichole! You never cease to amaze! What an incredible simple card – love the masculine feel & faux ribbon, how ingenious! love the faux ribbon . . . it’s plain & simple and yet classy enough for a woman too. I think it is a brilliant card. Once again, just wonderful! Can’t wait until the unveiling. Gotta love the kraft and not quite navy! Faux ribbon… what a great idea! Love the simplicity of it. Thanks for sharing. Once again you have wowed me. Another gorgeous creation – thank you for sharing them with us! Wow, you are amazing. I just found out about your blog yesterday and I have been reading it ever since. Your cards are so clean and fresh. Keep up the good work! Another great technique, cool colors. Nice and a great masculine card! So simple, and yet classy and gorgeous! Thanks for inspiring everyone so much~! Love this card…very clean lines. It can be used either as a feminine or masculine greeting. I can’t wait to see what you all are going to unveil in 2 days! such a stunning guy card. So simple – yet something the guys would like. I agree with another poster…a great guy card! Love the faux ribbon technique. I can’t wait to try it. Now you can have unlimited ribbon combinations! Once again, the simplicity of this card is beautiful. I am always amazed at how creative you artists are…WOW! Thanks for the great tip. Love the card. We can never have too many ideas for man cards. Who knew that simplicity and little masking can bring out such great results. Love the card design. Nice card! I like the paper piercing and the metal embellishments. Definitely great colors for a guy. I love the color combo and the metal accents–masculine and stylish, but not macho. I wouldn’t have guess by the picture that this was a faux ribbon. Very simple card and perfect for the males on your list. Again, another super card! So simple, elegant and just right! Love the colors too! Many thanks for sharing with us. Thanks for sharing another stunning card. What a great idea for a faux ribbon! Can’t wait to try it. Once again, thanks for sharing such a simple, but elegant card. What excitement! Your work is intriging me. Keep it up and good luck with this new line. The phrase “less is more” comes to mind. I love this card. I really wish I had your ability to make such beautiful and complete cards, they never look as though they need anything else!!!! It’s AMAZING. this is perfect… I actually have never heard of this; now I can’t wait to play tonight! Thanks! Love the clean, crisp images! Great card! Woohoo! One more sleep! I love your work so much!!! Can’t wait for the big unveiling! Loving your tips and tricks. Cool – at first glance I thought it was a ribbon! Nice “boy” card! Beautiful card! Love your blog! What a great card! TFS! Ooh, this looks fabulous! Love the masculine look to it! SHUT UP!!! CLEVER GIRL!!! Love it! Very cute, a new page to get ideas from. Great Idea! I would have never thought of that in a million years! What an amazing technique to create the faux ribbon! It looks so real! This is a striking perfectly masculine card! All I can say is WOW – you have the coolest ideas – what a great idea! It’s great to see an example of a nice “guy” card! Very simple but LOVELY male card! I love the faux ribbon. I love to use ribbon, but everything that i have seems too feminine. Can’t wait to try this. Great card!! Great idea!! Again!! You will always have the exact matching ribbon to your card. Marvelous!!! What a cool idea. When I first looked at this card I thought it was ribbon! I really like the color combo and the simplicity of the design. Can’t wait to try this technique. Thanks for sharing another great card. Great card!! Simple but very elegantly masculine. I know that’s a weird way to describe it, but that is what popped into my head!! I so appreciate the simple beauty of these cards, especially the faux ribbon. Great example of how to stretch the uses of the things you already have! TFS! All I can say is “ditto” to everything that has been written!!! Love the faux ribbon idea! Thanks for the great ideas! Wonderful idea! I never would have thought of it! That’s why you are a terrific artist! Inspiring creativity. I cannot wait until the 15th! Love this card! Perfect for boys! The faux ribbon looks fantastic! I love the simplicity of all the cards.. The stamp images are all so neat and clean, I can’t wait to see the first set debut! I have wondered about getting this color cardstock – kraft. It seems like a great base color — I have considered getting a pack of sahara sand as well. Beautiful work!! Thanks for sharing…. Very cool idea! I thought the masking was ribbon! Great colors! I have such a hard time with Masculine cards and I just love this one. Thanks for the daily inspiration. I love the faux ribbon!!! Any one would love this card – guy or gal. A gorgeous creation! Lovely! I like the dual hangars on each side. Oooh, I love the faux ribbon idea! Love this card – so neat! Love the idea for the ribbon -looks for realistic. I love this card! This is such a nice layout and I am seeing a trend toward making appealing cards by simplifying. Sometimes I complicate things by adding too much and this is reminds me to keep things clean and not too busy. I absolutely love this masculine idea. Thanks for that. I’ve been having some brain fog with manly ideas lately! I’ve done some masking but never thought to mask on a ribbon base. What a great way to keep it simple. I just love simplicity. My man would like this! Such a simple and elegant design, yet so wonderful at the same time. Great work, I love it! Lovely card. Simple in looks, but very classy!! Thumbs up!!! what a great and creative card! “man” cards are so hard for me, and this is just great! Cards for men. So nice and wonderful ideas. Thank you!!! Thanks for the technique! I’m off to make faux ribbons! Real cool technique- thanks for sharing! Thanks for the masking tips! You make it look sooo easy! I love this card. It shows what you can do with just a plain piece of cardstock. Love your stamps. 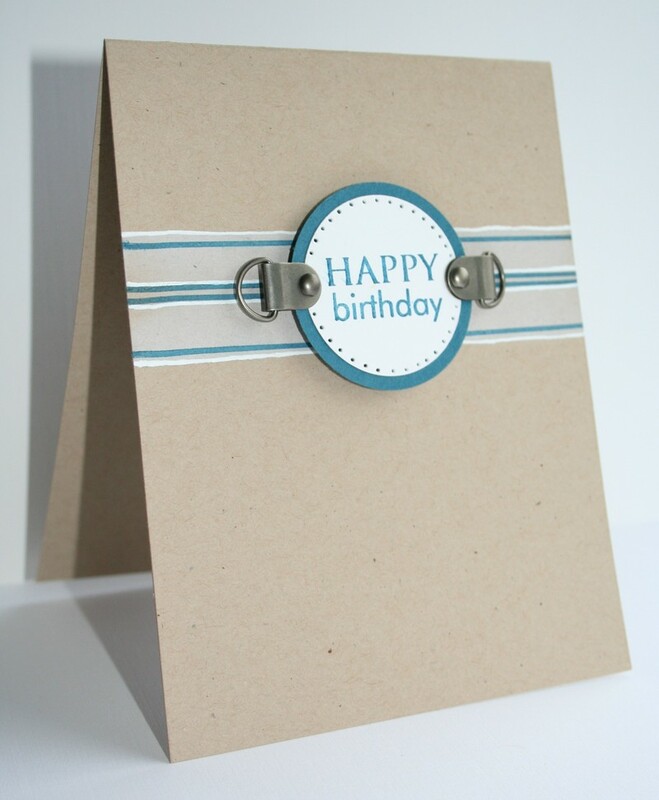 Love this simple, yet elegant card…. Great masculine card! Interesting on how you achieved your stripes! great idea! If I ever run out of ribbon (ha ha ha) I will know what to do! seriously, tho….this is a great idea and I will have to try it! Oh!!! That faux ribbon is so cool!! love the hardware you used!! This is fabulous! So clean and simple, yet striking! I struggle with coming up with guy cards because I always want to add some ribbon or glitter… this is a great design! I like your use of kraft cardstock – you don’t see it used much – the faux ribbon is certainly a “$ saver!! Beeeutiful! I love this design! Cute card. Can’t wait to see your stamp set tomorrow! Another great card! I love clean looking cards. Can’t wait to see the set! Wowee … I love seeing ideas for masculine cards. Great design and you do a great job with masking. Such a neat technique. I’m going to have to give this a try. Beautiful card. What a cute card! I love the “ribbon” look! Thanks for sharing the faux ribbon/masking technique. I love the simplicity in the design of your cards. I like the simplicity of this card, and it’s hard to find inspiration for a masculine card. What a job on the “ribbon”! I love your masked ribbon! Great manly card. wow! what nice colors! i love your idea of using stems to create the ribbon effect! Wishing you & your family a Valentine’s Day filled with oodles of LOVE. Love the hardware on todays card. I love this for a masculine birthday!! How great! I love the faux ribbon tips!! And I love the simple beauty of this card. Thanks for sharing. I can’t wait to see the stamp set. This is such a nice clean card! I love the style of it. Oh I just found your blog and am so excited by new stuff! These projects are such a tease! What a great card! I like the simplicity of it! Wow, what a beautiful card. I like your idea of making a faux ribbon. What a great idea. Thanks for sharing. Great guy card. This set sure has a lot of versatility! Love the faux ribbon idea! So glad I happened upon your blog! Love all of your beautiful cards! I’m always looking for new ideas for masculine cards and this is great! Love the faux ribbon technique….awesome! What an awesome idea for a “stem” stamp! and who can’t always use a masculine card?!? Love the hardware and the simply design! Oh wow! Love the idea of faux ribbon. Thanks for sharing how you did it. Hi! Congrats on the new company! Thanks for the ideas! This is an awesome card. I love it!! love this card, very simple and to the point. can’t wait for your stamp sets. I am going to try this today! Wow! I love how CLEAN and CRISP this card looks. What a great idea to mask off for “ribbon”. Clean, simple, not at all frou-frou. I love it. how exciting! Love a good debut. Thank you for sharing the faux ribbon technique. I also loved the paper piercing around the sentiment. Great card!!! I have such a hard time with “guy” cards. I love your sentiments. Wonderful card. Your new stamps are all the buzz in cyber space. I am excited to get to purchase them soon. Congratulations! What a great, simple, clean card! I love it, I need more masculine cards and this is great! I wish I had just a little tiny bit of your artistic skills! Only a few hours to go; once again, Good Luck with the new line! Such a nice masculine card … great job, and I really like the faux ribbon! Gosh! Masking…I never even thought of doing that to create a faux ribbon…what a great idea! I’m going to have to try this. Simple, yet effective….we all know how those guys love the hardware! so smart! love little tricks like this! I will have to try this technique! the final result is really nice! I love the simplicity of this card! Thanks for sharing! I know your new stamps will be a success! Perfect card for the perfect guy in your life! I love it! Have a stamp happy day! Simple, yet elegant – I love it!